This durable mesh wash bag is large enough to hold all your microfibres, including your mop fibres. Hang wash bag in laundry (fits the Norwex mop pads perfectly) place dirty fibres within it until you have enough to wash. 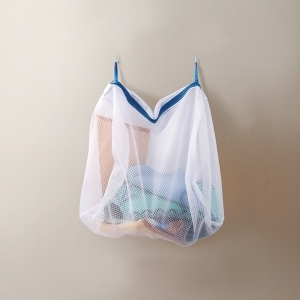 It is excellent for larger delicate items and/or baby clothing and transfers directly from washing machine to dryer. You can buy the Norwex Washing Net online from me, in Australia. Or you can buy it in New Zealand here. If you are elsewhere, check Norwex.com to find a consultant in your country.